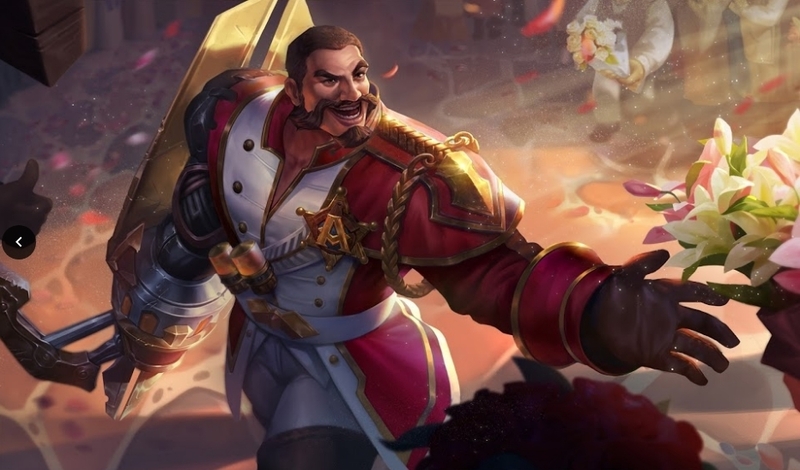 Toward the end of last week, community guy DJ Helsing put out a rather uncharacteristic video to the Arena of Valor Facebook page talking about the week’s news. At the end of the clip, he suggested that much more was on the way this week. Now that we’re about to enter another weekend of Arena of Valor, we’re inclined to say that he and the team made good on their promise. It’s been a pretty busy week for the game, and there’s quite a bit to catch up on down below. Strap yourselves in for one of the biggest Arena of Valor updates in quite some time. We’ll kick things off with the biggest news of the week – the August patch notes. We can’t list the whole lot here, but we finally know what to expect with this month’s update. But one of the biggest changes here is the removal of Asterion’s Buckler. The popular defense item has been entirely deleted from the game, and you’ll never get to see that beautifully blue shield ever again. Adjust your builds and strategies accordingly, and be prepared for a bunch of online guides to make no sense whatsoever. As for the rest of the patch, it’s still a little ambigious at the moment. There’s mention of a “Valor Pass”, more events and a vague “improved gaming experience” – but that could mean just about anything at this point. The patch itself is due to launch toward the end of next week on August 30. But the biggest of all currently known changes has to be that of the Antaris Battlefield map update. Dubbed “Battlefield Reborn”, this has nothing to do with EA’s popular shooter series. Instead, it’s formal confirmation that the map update we saw during the AWC finals last month is just a week or so away. And yes, the Mondester name stuck. Take a look at the video! Arena of Valor for Nintendo Switch Launches Next Month! Oh, you thought that was the biggest Arena of Valor news this week? Not at all. After nearly a year of false promises and little morsels of information, we now finally know exactly when Arena of Valor will launch on the Nintendo Switch. Well… the month, anyway. Arena of Valor for Nintendo Switch launches next month. September. That’s right, it’s just one month away. The best may have paled in comparison to the performance of the mobile version, but it’s still a controller-enabled MOBA that you can play both on a TV and on a bus. We think it deserves a bit of slack. Arena of Valor for Nintendo Switch is now confirmed to use seperate accounts, but Tencent do have plans to allow mobile players to unlock a bunch of characters by linking their accounts in some way. We’ll have more details on that a little closer to release. 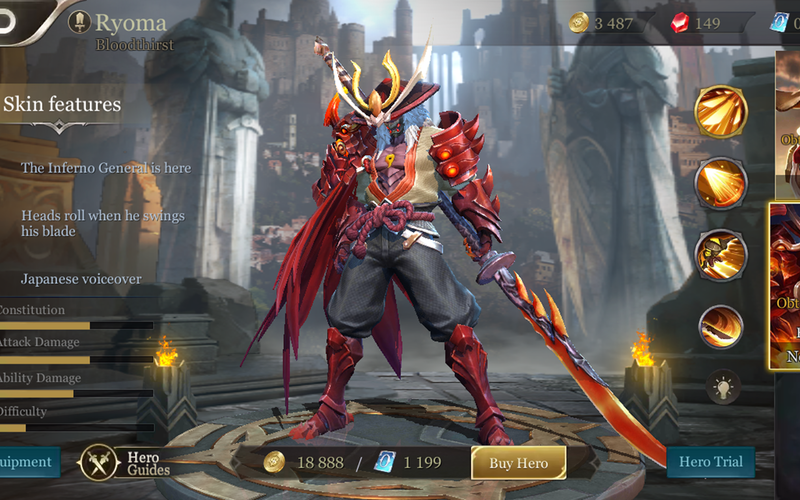 As for any collision with Nintendo’s forthcoming paid subscription, Arena of Valor will dodge it, meaning you won’t have to pay for the Nintendo Online Service to play Arena of Valor online. It’s completely free. And while you won’t be able to play against mobile users, Arena of Valor‘s Nintendo Switch service is worldwide, meaning there’s no userbase segregation like we see on mobile. Huzah! Continuing the new patch talk, this one deserves a section of its own – Rourke will be fixed! And before you ask, no, he isn’t getting straight-up removed from the game. What a waste that would be. So why all the fuss about Rourke? Well, he’ll been the talk of the Arena of Valor town for well over a month now thanks to his unique abilities. Designed to rip through armor like it’s cotton, Rourke became a popular pick not because of his tank-killing power, but because of a bug that’s taken far longer to fix than anyone could have anticipated. The bug itself caused bonus damage from his auto-attack to be wrongfully applied to towers, making Rourke a demolition king. He basically became a meta pick for all the wrong reasons. Thankfully, his reign of terror is about to end, and the Arena of Valor subreddit will need to find something else to complain about. Assuming you read last week’s guide, you’ll know that Valor Series Season 2 was announced the very same day. With the first professional Arena of Valor season coming to an end just under a month ago now, Tencent decided to waste no time when it came to the next. We’re riding the hype of one competitive season straight into the next, and Gamescom was the kick-off point of it all. Thursday at Gamescom saw Arena of Valor kick off the day’s events early. Pulling in talent from all over Europe, Valor Series powerhouses like For the Dream, Nova Esports, and even Team Queso came together on-stage to duke it out in a series of matches. If you missed yesterday’s stream and happen to have 8 hours to spare, you can watch the entire stream on YouTube whenever you want. Following the trend of Summer Bash skins before Summer officially parts for the cooler Autumn months, it’s only fitting to have the Diaochan, the frost queen herself, be the next in line to show off her beach body look. Just at other Summer Bash skins have proven very difficult to get, so to is this new one. She isn’t locked down the Pendant shop like Summer Bash Krixi and Taara, but you’ll still have to spend quite a bit of cash to unlock Diaochan’s more modest swimsuit attire. From now until Sunday, August 26, you’ll earn specific Diaochan skin tokens with each Voucher purchase. As you might expect, buying more Vouchers means getting more Diaochan skin tokens to redeem against the outfit, but the don’t scale in a way that rewards any bonus tokens for a bigger 6500 voucher purchase. Buying vouchers rewards you with Diaochan skin tokens automatically, and you can then use those same vouchers to buy more diaochan skin tokens from the store. You’ll need a total of 160 diaochan tokens to unlock her skin, so outside of daily challenge rewards, you’ll looking at You earn these tokens just through buying vouchers, so you’re free to spend that topped-up currency on anything you want. 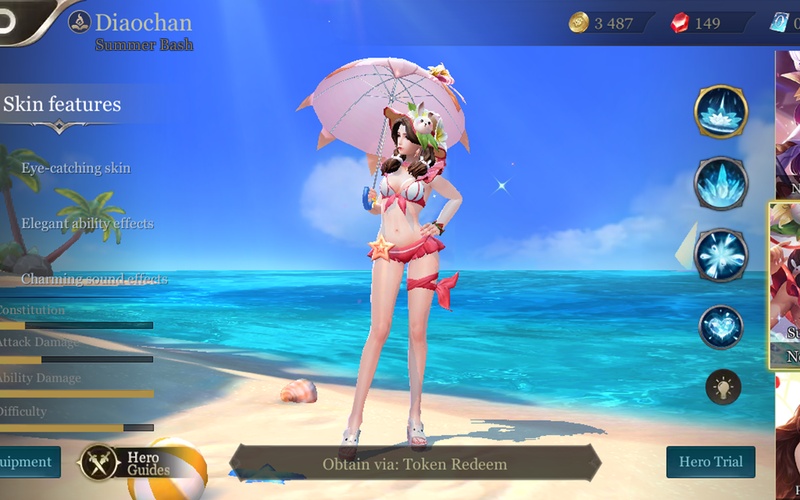 At 10 tokens per voucher, you only really need to spend 1600 tokens total to unlock the Summer Bash Diaochan skin. If you’re planning on topping up vouchers anyway, buying more will technically end up scoring you a cheaper skin. Just looking for the skin? You can pick up the 2500 voucher bundle and still have enough spare another low-level skin or two afterward. Last, and probably least given the rest of this week’s news, comes the Ryoma Bloodthirst skin. Without any fancy special intro effects like the Summer Bash skin that came alongside it, Bloodthirt Ryoma doesn’t really stand out above the crowd right now. If you’re a Ryoma player looking for a new outfit, though, this one is fairly easy to earn so long as you don’t mind the usual bit of RNG. Bloodthirst Ryoma can only be acquired through the Bloodthirst chest, and each one will set you back 30 vouchers. Inside each can be a variety things besides the Bloodthirst Ryoma skin itself. Crack one open and you might find a Ryoma character unlock, the Gunslinger Ryoma skin and trial card, Ryoma trial card, Bloodthirst Ryoma skin trial card, skin tokens, gems, and… the Bloodthirst Ryoma skin trial card again. We’re not sure why it’s in their twice, but that’s how it rolls with Arena of Valor sometimes.